Although you wouldn’t want to get on the wrong side of him would you? 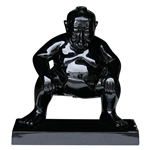 Moulded in the classic ‘starting pose’ of the Sumo Wrestler the detail in the moulding is simply stunning and highlighted superbly by the shiny finish that positively gleams. The solid mounting base adds to the chunky and robust appeal of the whole ornament. A tough polymer fiberglass is used in the mould which makes the finished Sumo hard wearing and tough just like the real life wrestlers. This will amaze friends and family who will instantly, ‘want one.’ so please, do tell them where you bought it! The hand applied lacquered finish means he’s unaffected by the elements throughout the year. Simply give a quick once over with a damp cloth periodically to restore the wonderful gleam that this Sumo is so accustomed to. We also sell a White Sumo Ornament.